Nothing like fresh farm eggs! What a beautiful basket of eggs !!! 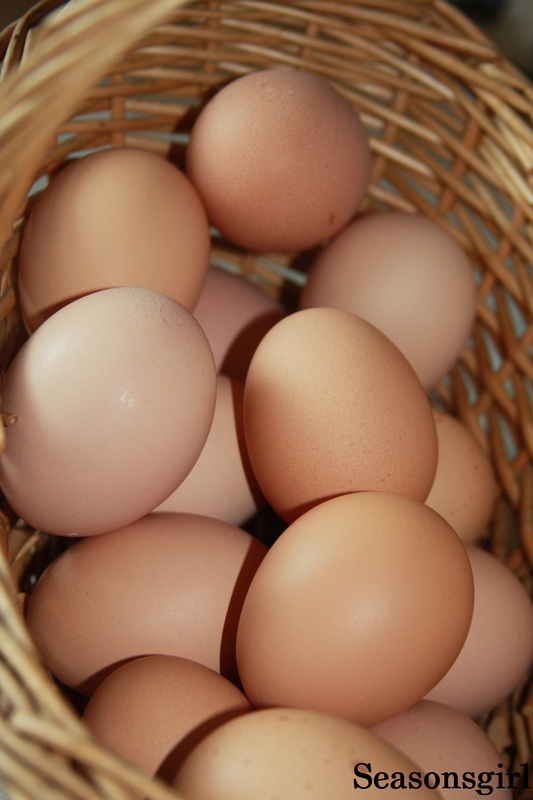 Don’t you just love gathering fresh brown, cream and blue eggs and then enjoy them in fresh bread, scrambled egg sandwiches and so much more. Any advice for the daughter who wants to raise chickens in our small city? I keep thinking of all the dogs in the neighborhood, to say nothing of the mammal wildlife. And then you post this to remind us of the delights of collecting fresh eggs. I wouldn’t recomend them for the city if they can’t roam some and get lots of grass. There are always preditors you just have to keep the ladies safe especially at night and early AM. Fresh eggs are a perk, but I would never recomend this perk at the risk of an animal having a less then happy life. But with the right city conditions a couple may do well. I would recomend her checking out a few books about chickens, coops, etc and see if she is up for it.